The three-hole washer game is easy to pack up and take to the beach or to a friend's barbecue. For entertainment in the backyard or on the beach, many people looking for summertime fun are playing the three-hole washer game. This game requires the use of boards with each board having three drilled holes. 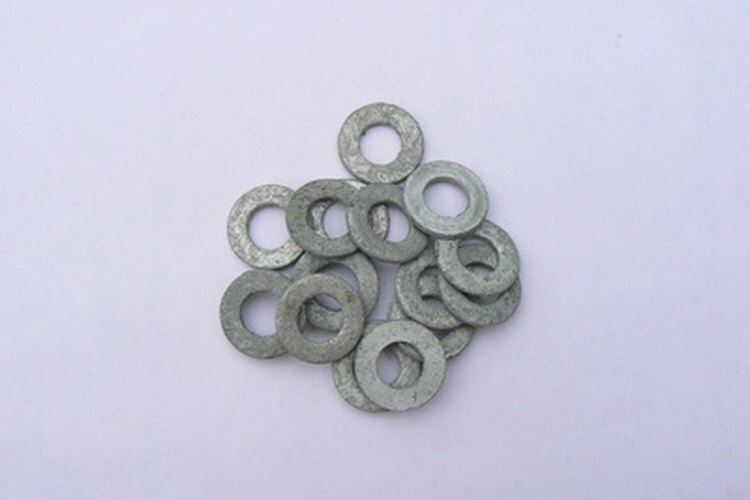 Players toss small metal washers in an attempt to get them through the holes in the boards. The portable boards sit best on short grass but they can also be placed on gravel, sand and other surfaces for a fun time wherever you and your friends go. Place the boards horizontal to each other so that all of the holes form a straight line. Separate the boards so that there is a 10-foot distance between the front edges of the boards. Players must toss their washers with both feet on the washer board. Stepping off of the board, or moving over the front of the board, is considered a foul and will result in the loss of a turn. Three-hole washer toss can be either a one-on-one or two-on-two sport. If the players are playing individually, they each start at one washer board for one round, and then switch sides and shoot from the other washer board for the next round. For team players, teammates stand at opposite washer boards and toss from the same board the entire game. For either game, each player throws three washers per round. One player throws all three washers and then the other player throws his or her three washers. Players throw the washers with the intention of landing them in the holes in the boards. The closest hole to the player is worth one point, the middle hole is worth three points and the farthest hole is worth five points. Washers only score points if they go completely through the hole and hit the ground. A washer hanging over the edge of one of the holes is not worth any points. After the first player has thrown the washers for the round, add up that player’s points. His or her opponent then throws and the opponent can cancel out some of the points. For example, if player one sinks one five-point shot and player two does the same, the points cancel each other out. Only points played in the same round can cancel each other out. The round is over once both players have thrown all three of their washers. The first player or team to reach 21 points wins the game. If a team is winning the game by 11 or more points, that team automatically wins. This is known as the skunk rule. If a team exceeds 21 points in a game, that team's score is reduced by the number of points that exceed 21. For example, if you start the round with 19 points and sink a five-point shot, you have reached 24 points. Your original score is reduced by the score that caused you to exceed 21, meaning that 19 is reduced by five and you continue the round with only 14 points. If a team has exactly 21 points, the players are allowed to toss the washers completely away from the board so as not to exceed the score.